I thought it was time for a scrapbook layout. If you were in my Scraps in the Mail, you will remember this layout. This layout uses the gorgeous chunky glitter, Sticky Cut letters and the Lucky Star tin! If you haven't tried the Sticky Cut letters yet, you should. Very easy to use and great for scrapbook pages. The stamped images use the Always stamp set! This stamp set is really versitle and great for card makers or scrappers. The bird is my favorite element in this stamp! Don't forget....Today is the last day to purchase the chipboard at the Special Discounted price! Spend $35 and receive the On Board Chipboard for 25% off! If you love chipboard... stock up! Lastly, if you were thinking about becoming a demonstrator... Today is your LAST chance at getting the steal of a DEAL! Only $159 plus the Hodgepodge Hardware of your choice. You cannot beat that! Get over $350 valued products and receive a 20% discount! If you have questions... just email me! 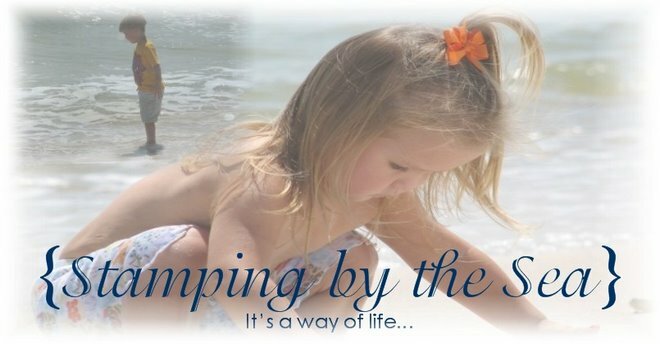 Life is always good when you're a Stampin' Up! demonstrator! I made these a few months back using the She's All That stamp set. I just love this chic because she is holding a coffee cup! This is me! I don't have a poodle however my doggie is just as small. These are just little post it note holders. I believe the original design came from the famous Paula Goff! She is ever so talented! If you check out the Scor-pal site I think you might find directions there. A few more Stitched Exotics! Hello once again! I'm back with a few more samples using the Stitched Exotics stamp set. 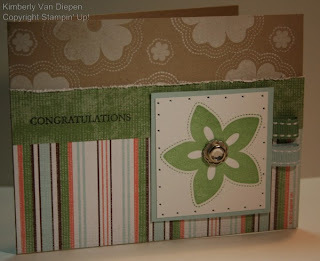 This card uses the beautiful Ginger Blossom Designer Series paper along wth the beautiful stamp set Bursting with Joy! 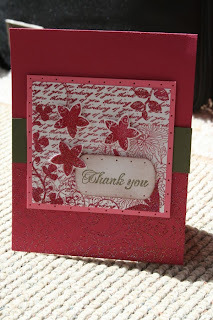 I stamped Ruby Red ink onto Kraft cardstock and I love how this came out. Once again I placed a Jumbo Eyelet in the center of the flower and then placed a clear Rhinestone brad in the middle of the Jumbo eyelet. The Rhinestone came from the Pretties Kit! Surely you have that because if you don't, you NEED it. Tons of great pieces come in the Pretties Kit! Now to the next card! Once again I used Kraft cardstock. 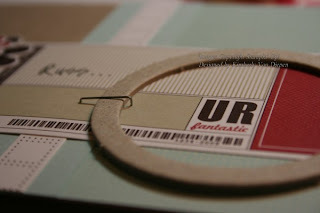 If you didn't know this about me, Kraft cardstock is one of my favs! 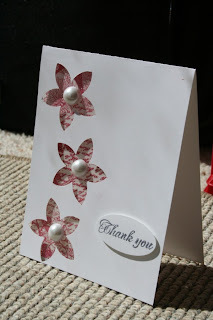 I stamped the large flower using Whisper White cardstock. Afternoon Tea Designer paper was used for the bottom portion of the card. 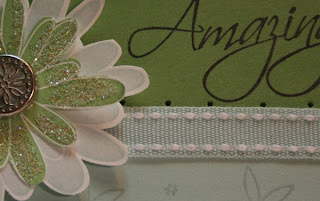 For the focal point I used the large flower stamped in Wild Wasabi and used a ribbon belt and clear rhinestone for the center of the flower. Lastly, I used a piece of Wild Wasabi and Soft Sky double stitched ribbon on the side of my focal point to add another embellishment. I hope you are enjoying the Stitched Exotics samples this week. Feeling inspired? Post a link in the comment section of your beautiful creations using Stitched Exotics. I would love to see them! An exclusive stamp club that comes to your door! It's time for another round of Stamps in the Mail and a new stamp set to play with! If you have never participated in this program, I highly recommend giving it a try. You won't be disappointed! The club will last for 3 months (Jun-Aug). Each month you will receive stamps and/or accessories in the mail plus all the materials to make 4 different cards or projects. just change the colors and stamps! in products. The other $30 is to cover the "class,"
pictures will be sent to you via email. receive a 20% discount on anything you add to your STAMPS IN THE MAIL order!!! shipping the third week of June. All products and materials should be received by the 20th of each month. Are you ready to start? RSVP by emailing me today! comfort of your own home. Stamps in the Mail can be paid by Cash, Check, Visa, MC, Discover, or Pay Pal! I finally ordered this stamp set after eyeballing it for quite some time. I couldn't resist any longer. I ordered the Stitched Background some time ago and truly this has to be one of my favorite backgrounds of all time. It is so elegant. I highly recommend this stamp to anyone. 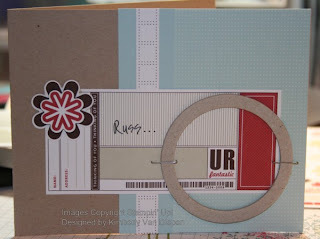 I wanted to show you a few samples today using this stamp set and over the week I will share more. I am really enjoying this stamp set! Not only can I not resist the stamp, I cannot resist Iridescent Ice! I love this embossing powder and have used it on almost every sample lately!! 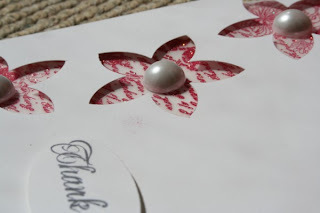 For the top sample I stamped that beautiful flourish in Whisper White and then sprinkled a little II powder over it. After I heated it, I stamped the Stitched Background over the top of it. After mounting this to Soft Sky cardstock, I stamped the big flower in Blue Bayou, and placed a jumbo eyelet in the center. I tied my double stitched ribbon right through the middle and ummmmm... it was so pretty. I didn't put a sentiment on this card for a reason. I need a few cards just to send. No sentiment needed. 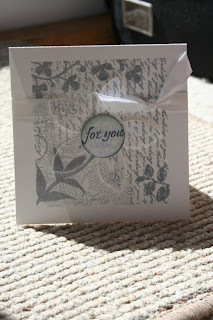 Now the bottom card is just a little card you can use as a gift card holder. For the front flap I stamped the small flourish in Blue Bayou and then used the outlined flourish with Whisper White and Iridescent Ice. It looked like a pretty prom dress. It was so pretty! I cut the large flower out and punched a hole in the middle and placed a pretty silver ribbon belt from the new Hodgepodge Hardware and pulled the Double Stitched through the ribbon belt to act as a belly band to keep the front cover closed. Hope that makes sense. Anyways, just a cute little card with a little elegance attached to it. Watch for more samples tomorrow! I love simple, however find myself never doing simple. This past week I was busy stamping for an upcoming craft show (more on that in a bit) and I did a few easy peezy cards I wanted to share with you. These are just 3x3 Whisper White cards made using a few Die Cut flowers found in our Mini Occassions and beautiful Rub On's. I added our Felt Fusion and a Rhinestone brad in the middle and Viola, they are DONE! 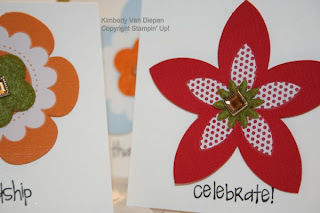 The sentiment on each of the cards was used from Just Celebrate. 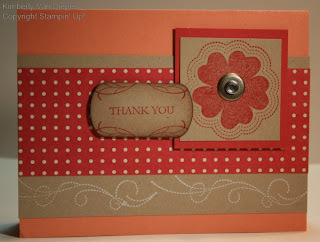 This is another mini catalog stamp I just LOVE! If you are looking for a great starter stamp set, this is the one to have. Lovely stamps with every sentiment you really need. Email me on how to purchase this great stamp set! Keep your eyeballs peeled on my blog tomorrow. 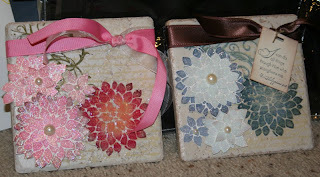 I will be showcasing the Stitched Exotics stamp set. I hope to inspire you with this lovely stamp set. Here is Lex in her TRUE stamping spirits! I was laughing so hard listening to her sing! You will want it! I *love* the Forever Together stamp set. It is so elegant and so fun to play with. Last night I really had glitter everywhere. I love playing with Irridescent Ice! It always adds such elegance to any thing you do with it. It was perfect to use with the Forever Together stamp. My arm almost hurts from all the stamping I have been doing. I have a huge craft fair in the next couple of days and I am trying to get ready for it. 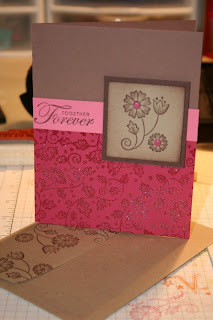 Here is a card made with the Forever Together Stamp. Oh so pretty! 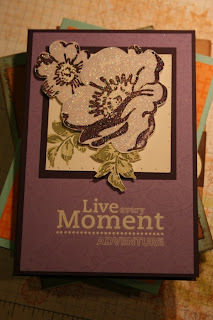 Then for another project...I used the Wild Rose stamp set and stamped the big rose with Pale Plum and Elegant Eggplant and stamped a Versamark Pad over the entire image and embossed it with Irridescent Ice to make this pretty memo pad holder. I cut out the roses and adhered it to the Whisper White cardstock. I used our Rub ons for the sentiment. The last picture is Lex being the TRUE stamper! She is stamping and listening to my iPod. 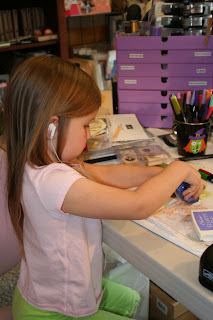 She was having a blast today just stamping away with mommy! I love times like this together. Happy Tuesday! I've finally been able to play with my cute new stamp set Fresh Cuts. I how elegant this stamp is. The 4x4 cards are adorable and so many fun things you can do with them. Let me take you on a tour of what I have done with them so far. 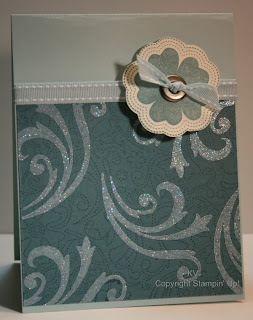 The top right card I used Brocade Blue craft ink and embossed with Irridescent Ice. I left the laser cut flower intact and just embossed the entire thing. The second one above, I took the laser cut flower out and placed a piece of cardstock vellum inside that was embossed with again... Irridescent Ice. Ohh la la. 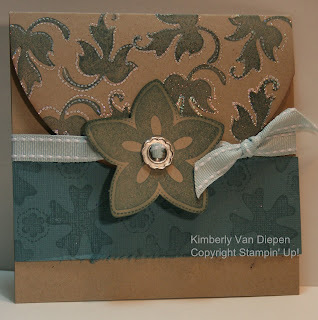 Love that embossing powder. So glittery!!! Now, below you will find some random cards made with the same stamp set. 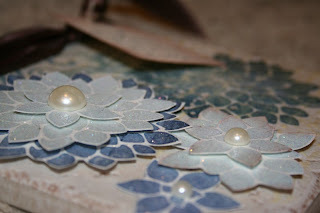 This time I took Rose Red Craft Ink and embossed again with Irridescent Ice EP. So pretty. Then, the last card I punched out three flowers using the 5 Petal punch and put then placed a piece of CS Vellum behind them. 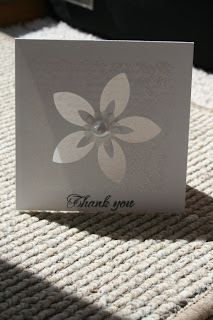 The Vellum was once again embossed with the same stuff and this really made a pretty SIMPLE card. I likey! Hope you likey too! That is what I think of my husband. Life is a little busy lately! Russ has finals and seems to have his nose in a book more than I would like. He warned me this week would be tough. Boy oh boy! It's all good... just a few days left. Since we are like two ships passing in the wind, I thought a little card may cheer him up and let him know I really do appreciate the sacrifices he's making by getting educated. Okay, so that is a lie... I have been cranky so I am making up for it. There ya have it. So this is a super duper easy peazy card. Now I gotta tell ya... I have a new favorite thing! 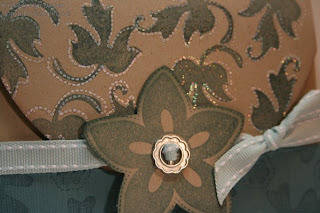 This card uses the Messenger Accents & Elements Tin and I just L*O*V*E it! I love the colors and I love all the little sayings. If it wasn't so late, I would crank out a few more of these. Maybe tomorrow. 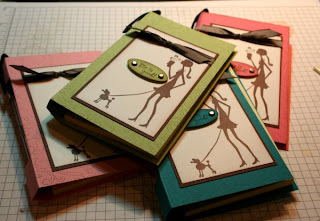 I also used the Notebook designer series paper along with my all time favorite cardstock, KRAFT! Lastly, I used some chipboard... NAKED, NAKED, NAKED!!! I know so many friends that just hoard this stuff because they are so unsure what to do with it. Just slap it on a card... It really is fun stuff!!! This card only took a few minutes to make and I love it!! So, the last bloggy entry I made said I would have a scrapbook page for you. Ummm... I do have it, but I can't post it for a bit. I will post it this weekend. I am so sad to say I only have one layout done. INSANE! Good news though. I just picked up a bunch of new photos and I plan to put them on paper this week. I have tons of ideas floating in my head just waiting to be put to paper. Happy Saturday! I wanted to share two very fun cards made this week. The Happy Birthday card uses that adorable Pun Fun stamp set. This is such a great stamp set to use for "kiddo" cards. One of my favorite techniques is to watercolor. I used my Blender Pen on the rocket to watercolor. 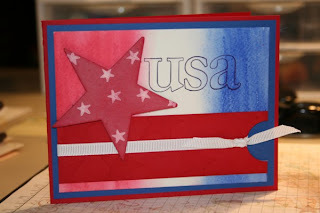 Then on my very patriotic card, I actually did a color wash using my watercolor crayons. I just scribbled on the watercolor paper and blended the color. I loved using the Jumbo Outline Alphabet on this card. This Alphabet set is so versitle and perfect for the scrapbooker. 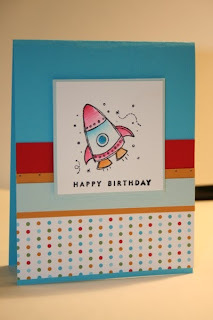 I colored my star chipboard using a sponge and ink and then stamped over it using the small star with Whisper White Craft Ink. I know it's National Scrapbook Weekend and I haven't shared a scrapbook page. However, guess what I am doing tonight? You guessed it. SCRAPBOOKING!!! I hope you will join me. 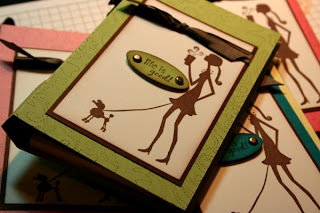 I can't wait to share my scrapbook layouts with you! 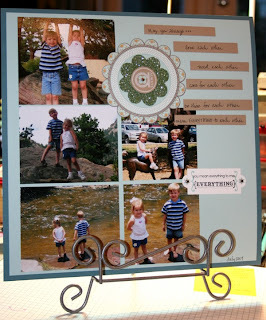 I challenge you to pull out your pictures and start scrapbooking those great memories! I am getting ready for a craft show this weekend. Luckily for me, my craft show partner is the BOMB when it comes to mass stamping. I have a terrible time making the same project a dozen times. It's kinda like swaps... I love to get them, just hate making them. I think it has to do with repetitive stamping? I don't know, but regardless... I get bored quickly. Today I spent a little time working on a few projects that I will add to the mix of our craft show. I thought I would share one of my favorites for the day. I love making decorative tiles. You really cannot screw them up and they always turn out beautiful. 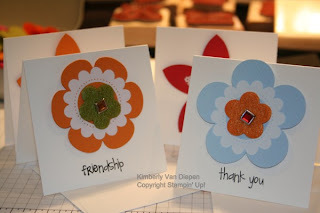 Since they are more for decorative use, I thought I would add a little pizazz to a few of them using one of my favorite stamp sets, Fabulous Flowers. I just love this flower. Here you can see a close up of both the tiles. 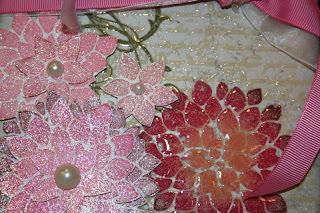 I stamped the Fabulous Flower many (TOO many) times and then used my Iridescent Ice to emboss each of the layers of the flower. Once they were stacked together with dimensionals I added a half back pearl to the center and it just added such elegance to the entire tile. Yes, a few retired materials such as Chocolate Chip ribbon and the sentiment on the blue tile were used. Couldn't help it!